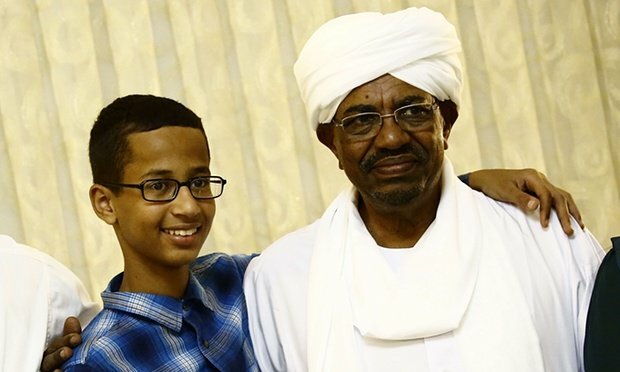 Ahmed Mohamed, the 14-year-old Texas student who made headlines after being arrested for bringing a homemade clock to school, has met Sudanese President Omar al-Bashir. The boy and his family were received at a presidential compound in Sudan’s capital Khartoum on October 14, according to state-run radio. Ahmed Mohamed was pulled out of class and handcuffed because a teacher mistook his clock for a bomb. His arrest was sharply criticized and the police declined to file charges. Ahmed’s father, Mohamed Hassan al-Sufi, is a Sudanese immigrant to the United States and a former presidential candidate who ran against Omar al-Bashir in two elections. President Omar al-Bashir is wanted by the International Criminal Court (ICC) for alleged war crimes in Darfur, which he denies. Ahmed Mohamed said he was pleased to meet the president and vowed to return one day with a new invention, according to the radio broadcast. The boy has also been invited to the White House by US President Barack Obama, who tweeted his support after the incident. NASA scientists and Facebook CEO Mark Zuckerberg also praised Ahmed Mohamed’s initiative. The police rejected a suggestion by Ahmed Mohamed’s family that he was detained because he was Muslim. Ahmed Mohamed is due to meet President Barack Obama in Washington, after attending a Muslim gala on October 17. On October 19, Ahmed Mohamed is expected to visit the White House for an evening of stargazing, as a special guest of the president.